Dr. Breana Prince is a certified physical therapist in dry needling, and the Lee Silverman Voice therapy for Parkinson’s Disease. 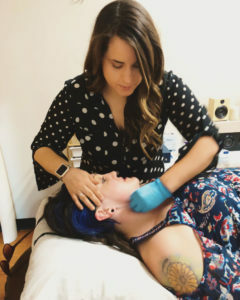 She developed and taught continuing education in the treatment of cupping for myofascial release. She studied at the University of Colorado Boulder under the Evan Scholars caddie program where she was picked along with 40 strangers to live in a house for 4 years rent and tuition free, like a scholarly “Real world”. She returned to Phoenix to attend Franklin Pierce University. She has a diverse background in golf, skiing, cross-fit, gymnastics, and treatment in chronic pain including women’s health. WHY IS LIMITLESS PHYSICAL THERAPY DIFFERENT? Time and persistence. She believes in the influence of our whole body, including our lifestyle as a factor in our pain or movement dysfunction. Treatment should not be a one- size fits all approach or an isolated view of the body part in question. Having the freedom of an hour one-on-one with a Doctor of physical therapy has been a game changer in how people respond, and the longevity of results that occur. It’s a frequent anecdote that a patient states that they had some relief in the past but the pain would quickly return a few days later. She has found that when we look at the whole body and isolate faulty movement patterns is where the treatment “magic” begins. She believes in the persistence in finding the root of the cause and believes that treatment session is truly an ongoing evaluation.